What returns can we expect from US shares over the next 10 years? According to Research Affiliates (RAFI), the 10-year annualized real (inflation-adjusted) return for the S&P 500 is a measly 0.7% per annum. The chart below (as at September 30, 2014) shows that the long-term expected return for US equities is the lowest of the 30 markets researched by RAFI. 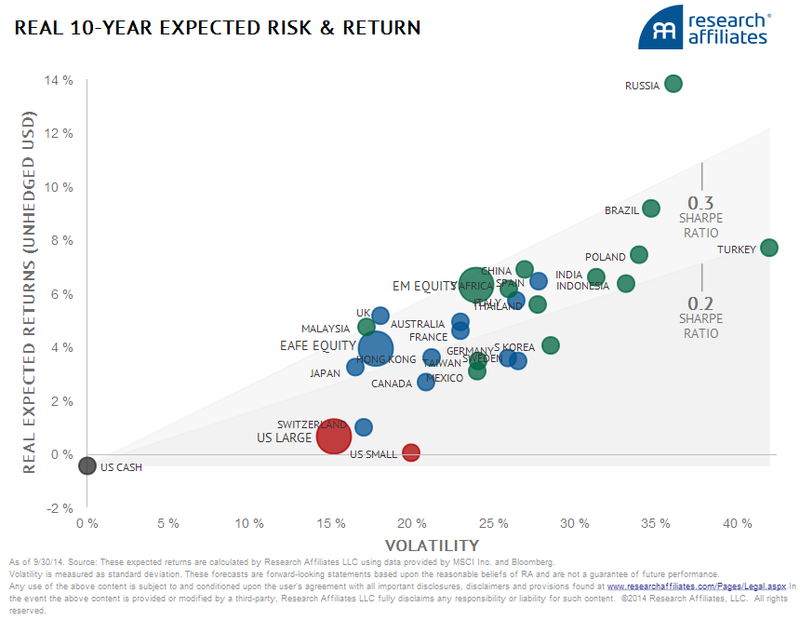 I created the chart using the Research Affiliates Expected Returns and Risk tool. The tool also has expected returns for fixed income, currencies and commodities. It is a very useful reference. Dividends are the primary driver of equity returns over the long term. If fact, if you hold equities long enough, most of your total return as an investor will come from dividends. Of course dividends are not static. Over time, the dividends paid by companies will grow as their earnings grow. Together dividends and earnings growth help us to estimate the future cash flows generated by all of the companies in the market. But what will investors pay for these cash flows in the future? This is where valuation plays its part. When investors are confident, they will pay more for a given set of future cash flows. Conversely, when investors are fearful, they will be pay a lot less. Valuation tends to even out over the long-term (in other words, it reverts to the mean), however it can dominate returns over the short-to-medium term. Many institutional investors use similar models to forecast the expected return for equities. While not exact, they do work reasonably well over the long-term (7-10 years). For example, a similar model has been used by Jack Bogle of Vanguard since the early 1990s to create a reasonably accurate long-term forecast for US shares*. The logic behind each of these inputs and the method used to calculate them can be found in RAFI’s Equity Methodology Overview. To be clear, RAFI aren’t suggesting that the investment return of the S&P 500 for each year from 2014 through to 2024 will be exactly 0.7% real per annum. The truth is that nobody knows what each year’s investment return will be. Rather the 0.7% number equals the annualized real (inflation-adjusted) return forecast from October 2014 through to October 2024. Let me repeat: the path to the forecast 0.7% annualized real return is impossible to predict. Their might be 7 positive years and 3 badly negative years. Or their might be 5 relatively flat years and 5 moderately negative years. We just don’t know; which is why this sort of analysis can’t be used for market timing. But it can be used by long-term investors to reduce the risk of a loss of capital, or to profit from periods where the expected returns offered by the market are unusually high. It can also be used to set realistic expectations. For example, if US shares have an expected real return of 0.7% and US long-term treasuries also have a an expected real return of 0.7%, then how is the typical US 60% equities: 40% bonds balanced fund going to deliver a decent return above inflation? It can’t. The 0.7% estimate will almost certainly be wrong. But the point of this exercise isn’t to figure out whether the 10-year real return for the S&P 500 will be 0.7% or 1.2% per annum. Rather, the point is to figure out the order of asset class returns. For example, will Australian shares out-perform US shares? Or will emerging market shares do better than European shares? These models work on the principle that “you don’t need to know how much someone weighs to know if they are fat”. Would an investor really want to invest in shares if the 10-year expected return after inflation was 0.7%? Would they be more likely to invest if it was 1.5%? How about if it was 2%? What about 3%? 3% might sound good, until they found out that the average annualized real return for US shares from 1963-2013 was 5.8%. Whatever the 10-year annualized real return for US shares turns out to be, the probability is that it will be low, much lower than the historical average for US shares. P.S. Here is a list of some of the references that I used in preparing this post. RAFI Capital Markets Expectations Methodology Overview. Previous What can we learn from Keynes? Thanks for putting these return forecasts together Daniel. I have always wondered what sustainable competitive advantage it is that the average investment manager and asset owner believes that they have over the vast majority of other asset owners and investment managers that would allow them to outperform the herd. I think that sort of question also applies to forecasting long-term returns and using those forecasts to construct investment portfolios. Please keep publishing interesting material. @ CapitalMarketsGuy – Thanks for your comments and encouragement. You pose some important questions. Here are some thoughts and observations that might help. How can you estimate the potential performance of a factor? There’s no foolproof way to do this. One approach might be to start with the long term historical performance of a factor (there’s lots of academic research on this) and then adjust this based on where the factor currently sits in its performance cycle. How do you measure the performance cycle of a factor? Interquartile range might help. For example, an investor might rank all of the stocks in the market by value. They might use a ratio such as price-to-book or price-to-earnings to do this. The next step is to work out the average valuation of stocks in the top quartile (20% most expensive) and bottom quartile (cheapest 20%). The “spread” or the difference between the quartiles measures the size of the potential opportunity for the factor. For example, if the difference between cheap and expensive stocks is small (i.e. the interquartile range is narrow), then the opportunity to out-perform by investing in cheaper stocks as opposed to expensive stocks is reduced. This makes sense because a narrow spread shows that the market isn’t really differentiating between cheap and expensive stocks. Conversely, if the spread between cheap and expensive is wide, then all other things being equal, the potential opportunity for out-performance is greater. Market timing. This is tough to do. The RAFI model is based primarily on valuation. Valuation works over the medium-to-long term. For market timing, you need indicators that work over a shorter time frame. The three that come to mind are momentum, sentiment and market technicals. Momentum and value are complementary opposites. Valuation is a contrarian strategy, while momentum is a trend-following strategy. Valuation is long-term while momentum is short term. Errors in expected returns. Most investors use this sort of analysis to develop a range of possible outcomes rather than a single point forecast. Vanguard does some great work on forecasting a range of possible outcomes. For example figure 17 on page 17 of Vanguard’s economic and investment outlook shows the probability-weighted distribution of expected returns at the beginning of 2014. It’s interesting to note the distribution has shifted to the right (i.e. a higher probability of lower returns) compared to where it was 12 months prior. The spread of the distribution provides an indication of just how wide the range of outcomes might be. As I tried to explain in my post, this is an inexact process but it’s an important one. Ironically Vanguard, the creators of this research, generally advise their clients to be buy-and-hold investors, even though their own research clearly demonstrate that the balance between risk and return is dynamic. Competitive advantage. I think most investors look for a competitive advantage in the wrong place. For example, they assume that an investment firm needs to hire the best and brightest MBAs, CFAs and PhDs, set them up in offices around the world to work round the clock analyzing investments. The reality is that other funds are also hiring MBAs, CFAs and PhDs and using similar methods. So it’s safe to assume that this is highly unlikely to be the source of a sustainable edge. To find a sustainable edge you need to look at “soft” factors such as integrity, culture and temperament. These are very difficult to measure but they are the most important. The reality is that it is almost impossible for any institutional investor to be a truly long-term investor. It comes back to the principal and agent problem that I’ve mentioned in several posts. The fact is that this sort of analysis needs a 7-10 years investment horizon to work. In rough terms, the correlation between value and future returns is very low over 1 year, but it rises steadily as the investment horizon lengthens. That’s not to say that it can’t work sooner, it often does, but investors need to be prepared to be patient. So if you’re looking for a competitive advantage, I think it’s more productive to look for a fund manager with integrity, the right temperament and a culture where long-term investing is encouraged. This is easier said than done.